Emma Charlotte Duerre Watson (born 15 April 1990) is an English actress, model, and activist. Born in Paris and brought up in Oxfordshire, Watson attended the Dragon School and trained as an actress at the Oxford branch of Stagecoach Theatre Arts. As a child artist, she rose to prominence after landing her first professional acting role as Hermione Granger in the Harry Potter film series, having acted only in school plays previously. 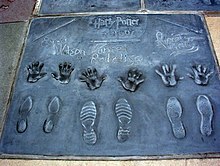 Watson appeared in all eight Harry Potter films from 2001 to 2011, earning worldwide fame, critical accolades, and around $60 million. By the age of ten, Watson had performed in various Stagecoach productions and school plays, including Arthur: The Young Years and The Happy Prince, but she had never acted professionally before the Harry Potter series. Following the Dragon School, Watson moved on to Headington School. While on film sets, she and her peers were tutored for up to five hours a day. In June 2006, she took GCSE school examinations in ten subjects, achieving eight A* and two A grades. In May 2007, she took AS levels in English, Geography, Art, and History of Art. The following year, she dropped History of Art to pursue the three A levels, receiving an A grade in each subject. 1 2 Walker, Tim (29 September 2012). "Emma Watson: Is there Life After Hermione?". The Independent. Archived from the original on 30 September 2012. Retrieved 12 January 2008. 1 2 Puig, Claudia (11 June 2013). "This Is the End – and It's Hilarious". USA Today. Archived from the original on 5 October 2015. Retrieved 18 November 2014. ↑ "A-Level results of the stars: Emma Watson, Benedict Cumberbatch, Matt Smith, Jenna Coleman – and the Doctor..." Radio Times. 17 August 2017. Retrieved 25 January 2019. ↑ Peck, Sally (10 July 2007). "Harry Potter's Sidekick 'Rich Enough To Retire'". The Telegraph. London. Archived from the original on 31 March 2014. Retrieved 25 February 2014. ↑ Schwartz, Alison (14 June 2010). "Daniel Radcliffe Calls Wrapping Up Harry Potter Devastating". People. Archived from the original on 8 February 2011. Retrieved 9 February 2011. ↑ Ebert, Roger (13 July 2011). "Harry Potter and the Deathly Hallows: Part 2". Chicago Sun-Times. Retrieved 15 November 2018. ↑ Alexandra Cheney, “’Downton Abbey’ Star is New Cinderella,” The Wall Street Journal, 30 April 2013. ↑ "The Vicar of Dibley – Comic Relief Special: The Bishop of Dibley". British Comedy Guide. Archived from the original on 9 April 2015. Retrieved 22 April 2015. ↑ Hooks, Bell (18 February 2016). "In Conversation with Bell Hooks and Emma Watson". PAPER. Archived from the original on 20 February 2016. Retrieved 21 February 2016. ↑ Kit, Borys (4 March 2015). "Disney's Beauty and the Beast Casting Dan Stevens as the Beast". The Hollywood Reporter. Archived from the original on 5 March 2015. Retrieved 5 March 2015. ↑ Foster, Alistair (15 February 2011). "Elle style icon? I have no idea who you are, Emma Watson". London Evening Standard. Archived from the original on 11 March 2011. Retrieved 29 November 2011. ↑ Ford, James (14 July 2009). "Catching up with Emma Watson". Paste. Archived from the original on 16 July 2009. Retrieved 15 July 2009. ↑ Adams, Char (7 August 2015). "Emma Watson Reveals She Took a Weeklong Vow of Silence After 'Horrendous' Split from Matt Janney". People. Archived from the original on 9 August 2015. Retrieved 9 August 2015. ↑ Watson, Emma [@EmWatson] (9 October 2015). "The week long meditation ..." (Tweet). Retrieved 9 October 2015 – via Twitter. ↑ Robinson, Joanna (8 March 2015). "Emma Watson on How Being Threatened for Speaking About Feminism Enraged and Motivated Her". Vanity Fair. Archived from the original on 9 March 2015. Retrieved 9 March 2015. When they saw that the minute I stepped up and talked about women's rights I was immediately threatened. I mean within less than 12 hours I was receiving threats. ... It's funny, people were like, 'Oh she's going to be so disheartened by this.' ... I was just raging. It made me so angry that I was just like, 'This is why I have to be doing this. If they were trying to put me off, it did the opposite'. ↑ Begley, Sarah (27 March 2015). "Emma Watson Named Most 'Outstanding Woman' In the World". Time. Archived from the original on 27 March 2015. Retrieved 27 March 2015. ↑ Sherwell, Philip; Lawler, David (16 April 2015). "Time 100: Emma Watson makes first appearance in the world's most influential list". The Telegraph. Archived from the original on 16 April 2015. Retrieved 16 April 2015. ↑ Andrews, Travis M. (6 March 2017). "'Feminism is not a stick with which to beat other women': Emma Watson tells off critics of revealing photo". The Washington Post. Retrieved 7 March 2017. ↑ "Emma Watson". Microsoft.com. Retrieved 7 April 2017. ↑ "Best Actress". Empire. 2008. Archived from the original on 16 September 2011. Retrieved 15 October 2011. ↑ "Twilight Leads the People's Choice Awards Nominations". PopSugar. 10 November 2009. Archived from the original on 7 April 2017. Retrieved 7 April 2017. ↑ "Twilight Dominates People's Choice Nominations Once Again". PopSugar. 9 November 2010. Archived from the original on 7 April 2017. Retrieved 7 April 2017. ↑ "MTV Movie Awards 2011 nominees". Entertainment Weekly. 3 May 2011. Archived from the original on 7 April 2017. Retrieved 7 April 2017. ↑ "Blake Lively Wins Choice TV Drama Actress The Teen Choice Awards! Here Are More Winners!". Hollywood Life. 7 August 2011. Archived from the original on 9 March 2016. Retrieved 23 May 2016. 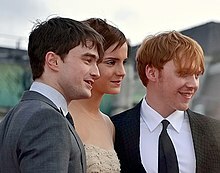 ↑ "MTV Movie Awards 2012: The winners in full". Digital Spy. 4 June 2012. Retrieved 7 April 2017. ↑ "2013 MTV Movie Awards winners list". Entertainment Weekly. 4 April 2013. Archived from the original on 18 January 2017. Retrieved 7 April 2017. ↑ "Robert Downey, Jr. & Judi Dench Among BAFTA LA Britannia Awards Honorees". Deadline Hollywood. 18 September 2014. Archived from the original on 19 September 2014. ↑ Hooton, Christopher (22 January 2018). "2018 Razzie awards: Emma Watson and Jennifer Lawrence among nominees for disservices to film". The Independent. Retrieved 5 February 2018. ↑ Pedersen, Erik (26 February 2018). "Nickelodeon Unveils 2018 Kids' Choice Awards Nominations". Deadline Hollywood. Retrieved 3 March 2018. ↑ McNary, Dave (15 March 2018). "'Black Panther,' 'Walking Dead' Rule Saturn Awards Nominations". Variety. Retrieved 16 March 2018.